CEA-Saclay, bât. 611, 91191 Gif-sur-Yvette cedex, France. Industrial methods of ultrasonic testing (UT) must perform ever more accurate and reliable defect characterization and sizing in cases of growing complexity. Simulation is increasingly used at the various stages of UT engineering, that is, both in laboratories and in field work. It is an effective way of determining or designing the appropriate transducer given a specific application. Performances of methods in complex configurations may be demonstrated at a far lower cost than experimentally. In field work, experts are helped in their interpretation by running simulations to check their guess, this resulting in more reliable diagnoses, and may even intervene in their formation. The CEA (French Atomic Energy Commission) has been developing for several years UT simulation tools, conceived to be easy to handle and use, accurate and efficient. Development is based on a two-step approach. At first, a tool is devoted to the calculation of ultrasonic fields radiated by transducers in components. Another one simulates an examination. It deals with various echo-formation mechanisms such as beam-defect interaction and transducer scanning. It uses previously computed field results as an input. These tools have been made progressively able to cover most UT configurations. The various stages in upgrading their capabilities have been validated experimentally, from the early simple ones (isotropic blocks of simple shape) to the present stage handling complex cases (heterogeneous anisotropic component of complex geometry). They are implemented in the CIVA system for processing, imaging and simulating NDT data [1, 2] and are operated through interactive graphical user interfaces (Figure 1). Fig 1: Graphical User Interface displaying the scene of the simulation (contact transducer inspecting a component of irregular shape). Various views may be displayed. Menus allow for the definition of the component, the transducer and its course, flaws and echo-structure to simulate (the whole or selected echoes). At first, the paper describes modeling tool capabilities. Then, examples of industrial applications of these UT simulation tools are presented. Tools are 3D to account for transducer diffraction effects and complex geometry of scatters and components. They are time-dependent for accurate prediction of waveforms variations. The model accounts for arbitrary ultrasonic sources of the industrial practice. The software deals with monolithic transducers or phased-arrays. Transducer is coupled directly to the component or by a coupling medium (solid wedge, fluid). Excitation pulse is arbitrary. Auxiliary tools are provided to conceive transducers (focusing probes, phased-arrays). Some UT applications involve components of simple shape ; others involve components of complex geometry. The model deals with arbitrary shaped components. The software handle components defined by a few parameters or complex ones described by CAD. Component may be of homogeneous isotropic or heterogeneous anisotropic structures. An heterogeneous material is described as a set of homogeneous regions described by CAD, each region having specific elastic properties (of arbitrary anisotropy). Only approximate semi-analytic approach can deal with arbitrary configurations whilst fulfilling requirements of accuracy and numerical efficiency for intensive use. Numerical integration is performed each time analytic methods fail at dealing with arbitrary descriptions. For example, an arbitrary source is treated as the superimposition of elementary point sources. Thus, the kernel of the computation consists in formulas derived for predicting the field radiated by a given source point at a given calculation point. The theoretical model has been derived by extending a geometrical method (pencil method, initially developed in electromagnetism ) to the case of elastic waves in arbitrary elastic media [2-4]. The pencil method efficiently handles complex geometric description of components. Then, the field radiated by the whole transducer at one calculation point is obtained by simply summing contributions of the various source points at the same calculation point. The model allows for the simulation of both pulse-echo and tandem configurations, and the scanning is either constrained by the component shape or independent of it. Calculations of the field radiated by the transmitter or of the sensitivity of the receiver to scattered waves involve most of the propagation phenomena. They are most demanding in computation time and therefore computed independently of the inspection simulation. The modeling tool for simulating UT experiments is restricted to the scattering processes. The component geometry may be simple and defined by a few parameters, or complex defined elsewhere by CAD. In performances demonstration, artificial defects are machined in test blocks such as flat-bottom holes, side-drilled holes, notches. In field works, defects like voids, inclusions or cracks are generally not of regular shapes. The software gives various means of defining several defects into the component, their shape, size and position. Various wavepaths from the transmitter to the receiver give rise to measurable contributions. Some involve only the interaction with the defects (direct contributions), others involve interaction only with the boundary of the component (geometric contributions), and others involve interaction with both component boundaries and defects (indirect contributions, e.g. corner effect). Each time waves interact with material discontinuities (boundary, defect), they are scattered as waves of the same nature or partially mode-converted. In some circumstances, one defect is seen by the receiver until the wavepath is intercepted by another defect (shadowing effect). All these complex features are commonly encountered in practice. The model must account for them and treats them separately to ease further interpretations. Again, only a semi-analytic approach can lead to computation time compatible with intensive use. Numerical integration is proceeded wherever necessary to account for arbitrary geometry of component or defect. Kirchhoff's elastodynamic formulas are used [6-8] to predict the amplitude of contributions scattered by defects or by irregularities of the boundary. Waves reflected or mode-converted on regular regions of the boundary are locally treated by the theory of plane wave scattering at interfaces. In tandem methods such as in TOFD configurations and when the insonified surface of the crack is not seen by the receiver, Kirchhoff's formulas cannot apply. A time-dependent Geometrical Theory of Diffraction has been especially derived to handle these cases [9 11]. This latter theory has been extended to deal with contributions involving scattering of Rayleigh waves along planar defects. Examples of industrial application, among numerous other ones, are given that use some of the model capabilities described in the previous paragraph. A short presentation is made to show how the problem in hand relates to features that are often encountered in industrial practice, though not necessarily commonly solved. When an ultrasonic source radiates into the component through a surface of irregular shape, beam pattern depends on transducer position and may be strongly affected (deviation, splitting or spreading). Field predictions help to determine if the zones of interest for the test are properly covered When conventional non adaptive transducers do not ensure scan coverage, phased-arrays may achieve it. Phased arrays are constituted of independently controlled elementary transducers. An adapted delay law makes it possible to synthesize a complex shaped wavefront that compensates for surface irregularities. By applying adapted laws at each transducer position, an ultrasonic beam of steady wanted characteristics may be obtained for the whole scanning. The three upper images of field radiation shown on Figure 2 illustrate how the field varies from one position to another in the case of a rather simple irregularity. Huge beam distortions are observed. In these examples, the transducer is a planar phased-array with no delay law applied, therefore behaving as a standard planar transducer. It is oriented to generate a refracted beam of compression waves propagating at 45° (L-45°) when insonifying a cylindrical component. Fig 2: a) CAD defined component of cylindrical symmetry. b) Fields radiated in the incident plane by a linear phased-array at three different positions without any delay law (upper) and with adapted delay laws accounting for the actual geometry of the component (lower). Now, the same phased-array is considered together with the ability to control it. First, the model for computing the field radiated is used to compute a priori adapted delay laws, given the CAD description of the component. Then, these laws being applied to field predictions, simulations demonstrate accurate compensations. Lower results shown on Figure 2 show that previous undesired behaviors are corrected with adapted delay laws at the various positions considered before. Delay laws were calculated to generate a L-45° beam focused at a depth of 30 mm (middle of the component). The 24 element linear phased-array considered is proved sufficient to compensate for sloop variations of the component surface. Complex inner structure of an austenitic stainless steel weld affects considerably ultrasonic beam propagation, and may lead to poor probability of detection of defects within. This depends on the type of ultrasonic source used for the test. More generally, beam propagation into heterogeneous and anisotropic structures cannot be intuited. Only ad hoc simulation tools can predict the complex phenomena arising in these cases. An austenitic stainless steel weld is consistently described at an ultrasonic scale as a set of homogeneous regions made of the same material (same stiffness constants) but of different crystallographic orientation, this leading to heterogeneous properties . Fig 3: An austenitic stainless steel weld is described as a set of nine homogeneous regions. Regions 0 are isotropic. Regions 1 to 7 are anisotropic. Crystallographic orientation is defined by a rotation around the  axis parallel to the welding direction. Field results displayed correspond to vertical displacements. An example is shown on Figure 3. The weld and the surrounding component are described as a heterogeneous medium made of nine homogeneous regions. Two of them describing the components to be welded are made of isotropic ferretic steel. The others describing the weld itself are made of stainless steel (orthotropic crystal which stiffness constants were measured ultrasonically ). Each region is oriented so that the crystallographic axis  lays along the welding direction. Thus, crystallographic directions of one homogeneous region are defined by one angle of rotation around this axis as tabulated in the figure. A disk transducer working in the thickness mode and directly coupled to the weld is considered. The field radiated shows both splitting and deviation effects, whereas, if an isotropic homogeneous piece be assumed, the field radiated would be of cylindrical symmetry. The component considered is constituted of two distinct sections which are welded. The surface on which the contact transducer is scanned has not been flattened and the surface opposite to it is very irregular (taper, root). This results in two effects. First, the orientation of the transducer wedge relatively to the local normal to the component slightly varies from one position of the scanning to one other. As a consequence, the direction of the transmitted beam varies too. Second, some contributions can be measured resulting of scattering of the incoming waves by the irregular geometry of the backwall and may be misinterpreted for defect echoes. Simulation helps the interpretation of measured data by distinguishing echoes involving a defect from those which do not. The various contributions being computed independently, they are recorded separately and therefore can be also analyzed one by one after the simulation has been computed. This allows for the true interpretation of the complex echo-structure produced in such complex configurations. Figure 4 shows a configuration where one reference reflector has been drilled (2-mm-diam side drilled hole) in the most regular region of the mock-up and three notches of 4-mm-height (10% of the average thickness of the component) have been machined, one in the same regular region, one in the tapered part close to the weld and a last one in the root of the weld. Fig 4: UT of an irregularly shaped component (taper weld). Two views of the component and the defects within are displayed. Simulated results are reconstructed in the component coordinate system and superimposed with CAD description. SDH denotes reference contributions from a side-drilled hole, G1 and G2, geometric contributions, N1 to N3, contributions from the notches. The simulated result is displayed after image processing as a reconstructed B-scan (B-scan data being transformed into data depending only on spatial co-ordinates). CIVA imaging tools permit to superimpose on this image the CAD description of the component. This allows straightforward interpretation of the various contributions. For the side-drilled hole reference, the echo-structure is composed of direct, corner and indirect echoes. The echo-structure arising from the first notch N1 is composed of a main contribution in the form of a corner echo and of contributions diffracted by the tip of the notch (direct and indirect diffraction), these two latter being of far lower amplitude. Then, contributions scattered by backwall irregularities are observed (G1). They are of low amplitude, however of the same order as that of the contributions scattered by the second notch (N2). 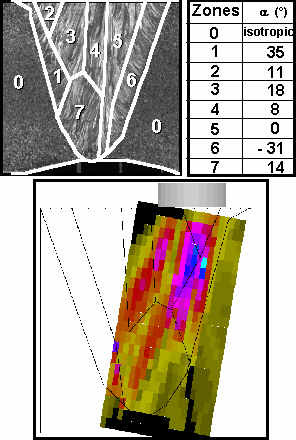 Other geometric contributions scattered by surface irregularities nearby the weld root are observed (G2). Finally, the third notch gives rise to a complicated echo-structure (N3) where direct diffraction as well as a corner echo distorted by the irregular geometry of the backwall surface are observed. Without an accurate knowledge of the contributions generated by geometrical irregularities, experimental data may be misinterpreted by mistaking a geometric echo for a defect echo or vice-versa. Modeling tools developed at the French Atomic Energy Commission for UT simulation handle a wide range of UT configurations, including complex ones. They are numerically efficient and allow for their intensive use in an industrial context. They are most useful tools in NDT engineering, for the help they provide for conceiving UT methods or demonstrating their performances. They also help experts to interpret actual measured data, by either simple comparison with simulated data or more sophistically by model-based inversion . Capabilities of these models have been discussed in the first part of the paper. Some of these capabilities have been illustrated by examples given in the second part. Further modeling capabilities are under development or will be considered in the future to extend the ranges of applications to more unusual configurations of UT. L. Paradis, M. Talvard, Ph. Benoist, Ph. Rizzo, G. Pascal and G. Bayon, Rev. Prog. QNDE, D. O. Thompson and D. E. Chimenti eds., 17 (Plenum Press, New-York, 1998), pp. 1981-1987. A. Lhémery, Rev. Prog. QNDE, op. cit., 18 (1999), pp. 671-678. N. Gengembre and A. Lhémery, Rev. Prog. QNDE, op. cit., 18 (1999), pp. 1131-1138. N. Gengembre and A. Lhémery, Rev. Prog. QNDE, op. cit., 19 (2000), pp. 977-984. G. A. Deschamps, Proc. I.E.E.E. 60 (1972), pp. 1022-1035. P. Calmon and O. Roy, Rev. Prog. QNDE, op. cit. 13 (1994), pp. 101-108. R. Raillon, P. Calmon, L. Paradis and Ph. Morisseau, in proceedings of the 1st International Conference on NDE in relation to structural integrity for nuclear and pressurised, M. Bičth and J.-L. Monjaret eds., (Woodhead, 1998), pp. 933-940. R. Raillon and I. Lecur-Taďbi, Ultrasonics 38 (2000), pp. 527-530. L. Butin and A. Lhémery, Rev. Prog. QNDE, op. cit., 18 (1999), pp. 135-142. B. Chassignole, D. Villard, G. N'guyen Van Chi, N. Gengembre, A. Lhémery, Rev. Prog. QNDE, op. cit., 19 (2000), pp. 153-160. M. Faur, O. Roy, Ph. Benoist, J. Oksman and Ph. Morisseau, Rev. Prog. QNDE, op. cit. 16 (1997), pp. 67-74.